1What are the origins of Cryotherapy? 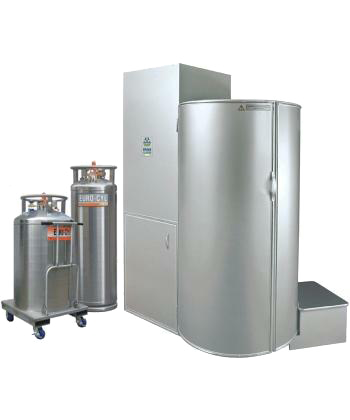 Cryotherapy was first utilized in Japan in 1978 as a modality to treat rheumatic diseases. Individuals stand and slowly turn while gasiform nitrogen lowers the client's skin surface temperature by to approximately 30 degrees Fahrenheit over a period of two to three minutes. The skin’s cold receptors rapidly signal the brain to activate the body’s most powerful survival mechanisms. This results in the release of endorphins. 4Is nitrogen dangerous to human beings? No, nitrogen is a non-toxic gas. In fact, Nitrogen accounts for about 78% of the air we breathe. However, like any other gas, excessive inhalation causes hypoxia, or lack of oxygen to the brain-which can cause fainting. Therefore, individuals are instructed to breathe up or hold their breath during the duration of the treatment. The vast majority of individuals are surprised to feel how tolerable cryotherapy is given such extreme temperatures. Unlike ice baths, cryotherapy is 'dry' treatment which only affects the outermost layer of skin, without penetrating deeper tissues. Core temperature is maintained during exposure. 6Can I go about my daily activities following a treatment? Absolutely. There are no precautionary recommendations. Cryotherapy is a very energy costly treatment; caloric expenditure, as measured my indirect calorimetry, is markedly increased due to heat production. With this, active individuals (especially athletes) may require additional calories to replenish fuel stores prior to competition. 7How many treatments should I do? Treatment frequency is recommended depending on the individual and the severity of their condition and current state. A typical course of treatment consists of 8 to 10 sessions separated by 1-2 days, or 3 times a week. 8What if I have a cold? Cold symptoms are attributed to suppressed immune function. Cryotherapy stimulates the immune system can help decrease the severity and frequency of future colds. 9I am claustrophobic. May I use Cryotherapy? Yes, you may. The door is never locked and you may step out at any moment. The chamber is open to the top and your head is raised above the level of the upper rim of the chamber. 10What conditions are contraindicated for Cryotherapy? The following conditions are contraindications to Cryotherapy: pregnancy, severe hypertension (BP> 180/100), acute or recent myocardial infarction, unstable angina pectoris, arrhythmia, symptomatic cardiovascular disease, cardiac pacemaker, peripheral arterial occlusive disease, venous thrombosis, acute or recent cerebrovascular accident, uncontrolled seizures, Raynaud’s Syndrome, fever, tumor disease, symptomatic lung disorders, bleeding disorders, severe anemia, infection, claustrophobia, cold allergy, age less than 18 years (parental consent to treatment needed), acute kidney and urinary tract diseases. Scottsdale Cryotherapy is located inside Illumina Health at 9393 N 90th St, Suite 108B, Scottsdale, Arizona 85268. From the Loop 101, take the 90th Street exit (exit 42) and head North, Go through the traffic light at Via Linda and make your first right into the shopping center. Drive past the first building and take a left in to the adjoining parking lot. Park anywhere in this lot, Illumina Health will be on your right next to State Farm. Once inside, Please sign-in and press the doorbell to alert therapist you have arrived. …the cryo-sauna meets the needs of the professional athletes that I work with by allowing them to train at a higher level of intensity, recover faster, reduce down-time due to injury, and perform better than any other recovery product on the market.